I wasn’t quite sure though if the range would suit my skin, so the kind sales promoter gave me a bunch of samples to try out before I buy. I thought it was very generous of her! The name certainly is cute. The texture of this day moisturiser is that of a cream. It feels fairly thick but absorbs well. However, I did not quite like this for the day because I felt it made my face feel oilier throughout the day. Also, the fragrance in the product was quite strong and it was just not very nice overall. I did not finish the sachet at all. The night moisturiser on the other hand, is a treat. I really liked it. Although it was thick, it also absorbed well and my skin felt nice and moisturised. There is a fragrance but it was hardly noticable, so faint it was. I liked that and as it spreads well, not much product is needed each time. I can see myself buying this. This is a body butter and the fragrance in this one is strong. I’d have preferred if they had kept the fragrance minimal like in the night moisturiser. Performance wise, this body butter is rich and thick and did help moisturise the skin, even if my skin felt a little oily after applying. It takes a while for it to really sink into the skin and I think it would be better for those with really dry skin or living in dry climates. I’m finishing up my night moisturiser sample and would love to repurchase if I ever go down to Singapore again soon. I do not expect to see this line here in Malaysia because it is in fact, an Israeli brand and the political situation does not allow it. So even if I do get the night cream, restocking would be a problem for me. Yes to Carrots is getting rave reviews in the USA and is found in the drugstores there. If you are particular about the contents of your skincare, then, you might want to say Yes to Carrots for being paraben free. Hey that’s a cute name for a skincare range….and I would love to try them out too! Any idea if it’s cheaper in US or Singapore? Oooh this is something which I’d love to try out. This is available in Target, but it isn’t cheap though for a drugstore brand. Well, in Australia anyway. giddy tigress: Yep, it was so cute I had to check it out. Unfortunately the prices escape me at this time! It wasn’t super cheap but neither was it super expensive. Tine: Do check it out and report! Beautyfool: Oh yes, the body butter did feel nicer than those from the Body Shop. The scent was a bit strong though. wow the only carrot product I’ve used is the face shop’s carrot facial wash, it was discontinued! I still cannot get myself to get anything from the range. I guess, no compelling factor like delicious smell. The only thing is the minerals from the dead sea, but then…I should try to demand for samples next time. I don’t see any promoters around for this though. Nikki: The only carrot cream I used before was from The Body Shop. Think its discontinued too. Sesame: Definitely no delicious smell. There was a young girl doing the promotion the day I was there so I guess I’m lucky! Definitely try the samples first. So cutesy, the name! I’m just wondering… will the skin turn yellow (i.e. jaundiced) if product is overused? loveee the adorable packaging! but apparently, carrots have properties to tan the skin, so i think i’ll stay clear! It’s a definite 10 for the design! 🙂 So many things to check out when in Sg! Rinnah: Well I sure hope not! The cream is white though. Helly: Do carrots do that? Well I’m glad I only got samples! These are only sample packs by the way, the product comes in jars. Lol.. you found the body butter strongly scented? I thought the scent was really light (for a body butter). But then again, the butters I test out are always so headily fragranced that I have to open a window! 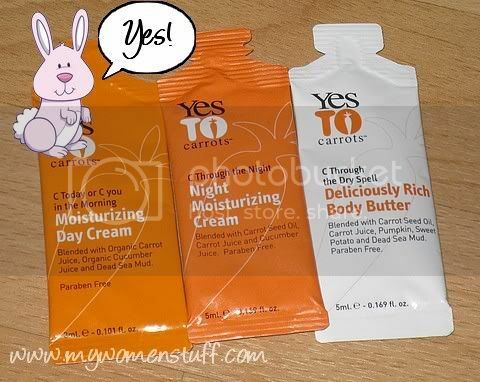 Glad you tried out Yes To Carrots and enjoyed the night cream and body butter. I must say that I do love this face cream. It would seem that it should be for younger skin than mine, as i am menopausal, but I can honestly say it has been the very best for my skin. It tones and firms and gets rid of the crepeiness of my skin for SURE. It minimizes the larger pores as well. It continues to keep it SOFT through out the day without ANY greasiness. It is STABLE!!!! I dont know why it works, but it does and it does HEALTHY things for my skin. Some creams tighten, some soften, some get gummy, some thin skin TOO much, but Yes To Carrots FEEDS the skin. I also use it at night for now. Along with my Covertox 10 powder and a small amount of foundation this cream reduces my skin damage by a lot. Please dont stop making this. I cant tell you how happy I am that you make something that is GOOD for skin, not just a short term nothing fix.